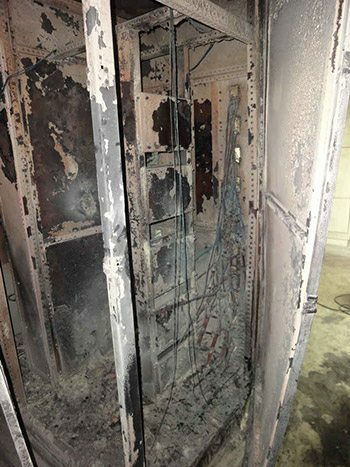 The heat from failed capacitor bank completely destroyed the attached main incomer 400 volt switchboard for a very large shopping mall and spread the fire around substation. The radiant heat from this fire also destroyed the control panel and switchboard for the emergency power generator that was located directly opposite. The layout of the plant and the design of the building play a major part in reducing the spread of fire and the effect of explosions. For example, equipment and buildings should be arranged to have vents which rupture rather than allowing an explosion to damage the main fabric.Site supervisors should ensure that these vents are never obstructed. In the prevention of fire, cleanliness and tidiness are very important, as is the careful maintenance of tools. Most fires are caused either by carelessness or faulty equipment. The choice of fire-fighting equipment is dependent on its suitability for electrical fires but also on cost and the importance of the electrical supplies at the point in question. Portable manual types are as follows: halon gas of various kinds, carbon dioxide chemical foam and powder. Fixed systems use water sprinklers, carbon dioxide and halon gas. Both halon gas and carbon dioxide can suffocate personnel trapped in the discharge area. Strict precautions must therefore be taken to lock-off the equipment when staff are present. There is also the used of sand, blankets and fire hoses. Fire doors are a very important means of limiting the spread of fire, and ventilating systems should also be provided with automatic shut-down if not with automatic dampers in the event of fire. Fire drill is also important and should not be neglected on a building site. Cabling may also be a cause of serious fires with risks of extensive damage to the installation and danger to personnel. Low smoke and fume (LSF) cables are now available in a number of forms, most of which will reduce the flammability as well as causing less poisonous gas to be released when they are heated. The d.c. supplies (UPS batteries) are a particularly important and vulnerable part of any installation. They are generally derived from stationary batteries which give off flammable and toxic gases. Batteries should be in a separate room with an acid-resistant floor, special lighting fittings, a suitable sink and adequate water supplies. 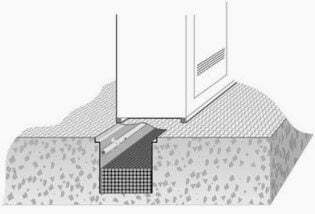 It is wise to have an acid-resistant drainage system. The room must be properly ventilated but sunlight must not be allowed to shine directly on to the cells. Electrical arcing and the build-up of static electrical charge within equipment. Overheating of electrical control equipment, switchgear and cabling. Once initiated, a fire may rapidly spread due to the presence of large amounts of combustible material in the form of hydrocarbons contained in cabling and insulation. The environment within uninterrupted power supply areas (i.e. battery room) may become explosive from the build up of high concentrations of hydrogen gas. 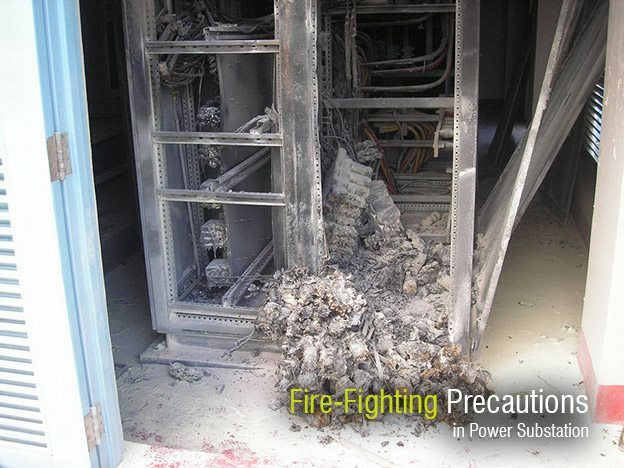 Substations are usually unmanned, thus, early intervention by staff may not be possible in the event of a fire. High air movement, caused by air-conditioning dilutes and disperses the smoke. Much of the mission critical equipment is housed within equipment cabinets and incabinet fires may take some time to be detected by ceiling mounted detection devices, especially since in-cabinet fires will usually have prolonged incipient (smouldering) stages. Underground cable trenches linking the main areas of the substation are considered hostile environments. High levels of background pollution present in these areas will affect the reliable operation of conventional detectors as well as being a source of false (nuisance) alarms. Table 1 below shows the operational areas within a substation in which protection is required. The Switch Room accommodates high density of electronic equipment housed in cabinets and automated switch-gear. In-cabinet equipment maintain the primary functions of the facility and form the switching interface between the Control Room and the field equipment. The area may also accommodate a significant amount of metering and logging equipment. Due to the high volume of critical electronic equipment, it is essential that a fire event be detected before the operation of the plant is compromised. The control room is the main command centre of the substation. The entire operation of the site is monitored and controlled from this central location. A control room may range from a small, seldom manned, non-ventilated room to a large, air conditioned area containing numerous staff members and electronic equipment (PCs, control panels/consoles, electrical and electronic switching devices, underfloor cabling, etc.). The Battery Room houses lead acid or nickel cadmium batteries for uninterrupted power supply (UPS) to the substation. Battery rooms may consist of a slightly corrosive atmosphere (sulphuric acid). It is recommended that a polymeric sampling pipe network is used to eliminate the potential for corrosion. In addition there may be a need to incorporate a ‘Chemical Filter’ – a special filter designed to absorb corrosive gaseous contaminants. A Cable Trench is located under the Switch/Relay Room, Control Room and Battery Room to house the communication, control and power cables between the substation’s operational areas as well as transport power to external high voltage switching towers. The most efficient way to protect a Cable Trench is to install sampling pipe network at the top 10% of the trench’s height (Figure 2). Hope this will help you to better understand vector groups.